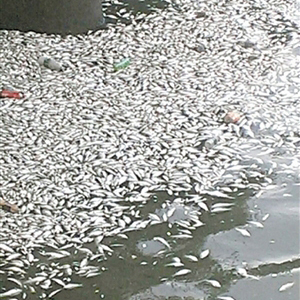 It’s reported that lots of dead fish floated on Shenzhen Bay stretching 2 kilometers long at the middle of August. Citizens doubted that it was caused by water contamination. According to Shenzhen Evening News, the dead fish came from Shenzhen Bay Inner Lake Park. As the park was doing construction work in the lake, the sluice which is connecting the lake and Shenzhen Bay was closed for more than ten days, making the lake was lack of oxygen. That’s why the fish were dead, the management of the park responded. Located at one side of Houhai Bridge, the Inner Lake Park was planned in 2013 and will be completed by March, 2016.